Mr A and I were kindly given a changing mat for Coco, and due to space constraints in the nursery, we’ve set it up on a chest of drawers for changing. Having heard a lot of babies who love nappy free time, and who get a little ‘wee’ happy, I thought it would be best to make a waterproof change mat cover to go over the change mat which will allow us to simple wipe down the cover instead of having to wash the whole thing when ‘accidents’ occur. I thought having a completely waterproof fabric across the change mat might be a little cold for Coco, so decided to do a combined minky / PUL combination. This will allow Coco to lay on the warm minky, whilst we change nappies on the waterproof PUL section. I used this tutorial as the guide, and simply swapped out fabrics to suit what I wanted. One piece of advice is to make sure you measure your change mat before you sew or cut, because I followed this tutorial thinking it was a universal size, but it turns out our change mat is waaaay bigger! 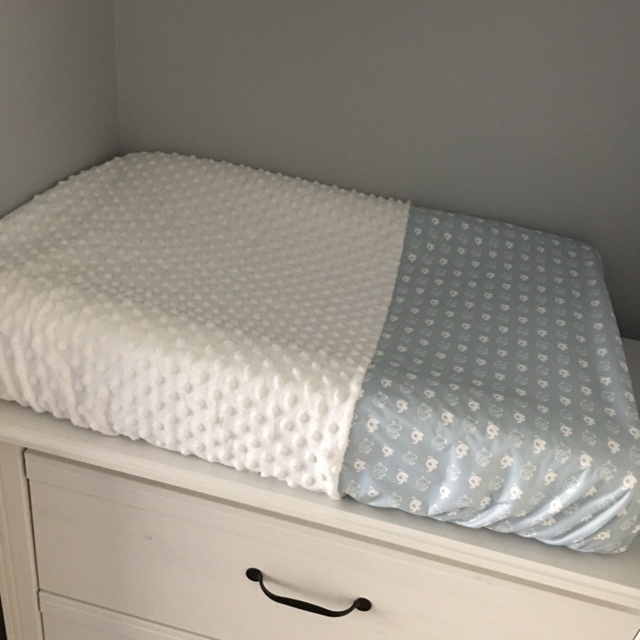 Here’s how it turned out – I’m super happy with it, and the minky is sure to keep Coco nice and warm, whilst the PUL is sure to be easy to wipe down for any ‘accidents’ whilst nappy changing. It took us about 5 days on and off to paint the nursery – I’m sure we could’ve completed it quicker, but Mr A & I were painting after work so it took a little bit longer. This is not the greatest photo, as we need to get a new light in the nursery but here you can see the navy blue feature wall. I have some great memories whilst painting this room, including Mr A busting out to Taylor Swift whilst rolling, not realising I was standing at the door watching. These are all the kinds of moments that I record in our pregnancy journal, which perhaps Coco will one day read. 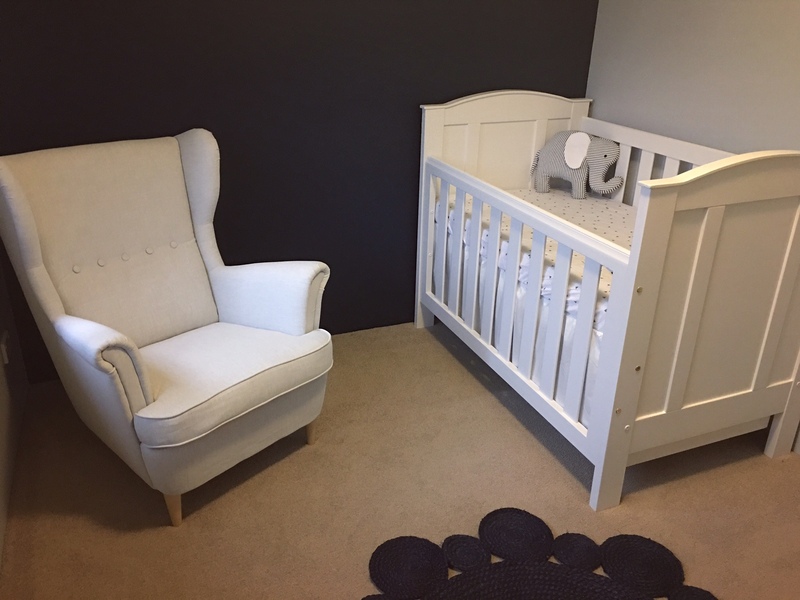 We placed the chair, the cot and the navy blue jute rug in the room and I had a quiet sit down in the chair once we had finished – it is so comfy! I can’t wait to cuddle Coco in there. At the moment I feel the nursery lacks some personality, as it’s very gender neutral, but I figure it will be easy to add boy or girl prints / items in once Coco is here. Here’s what the nursery looks like with furniture in it. I am so pleased with how the cot turned out. I’m putting together the dresser that will double as the change table at the moment. Some additional touches to go are to mount the curtain rail and add the curtains, and turn the chair into a rocking chair with an ottoman. 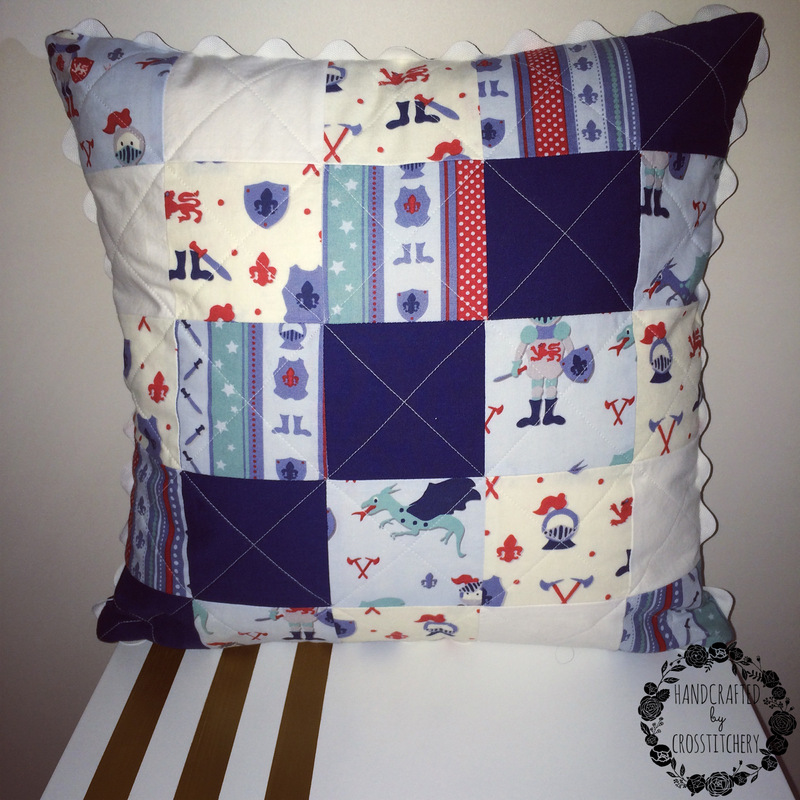 I have 1 more quilt order to go, and once that’s done I’ll be starting on some DIY’s for Coco’s room. I’m planning to make a baby mobile, a quilt, possibly some bunting, and I’m looking into some DIY shelves to hold books. I have to be careful not to add to much into the nursery too soon, as I’m sure once Coco is here I’ll want to add boy or girl things. For the moment, this is a great starting base and a cosy room for Coco to grow and be loved in. I’ll be sure to take some more photos and post them once we are closer to Coco arriving, as by this stage some DIY’s and final touches will be complete, and we’ll also have a better light in the nursery! 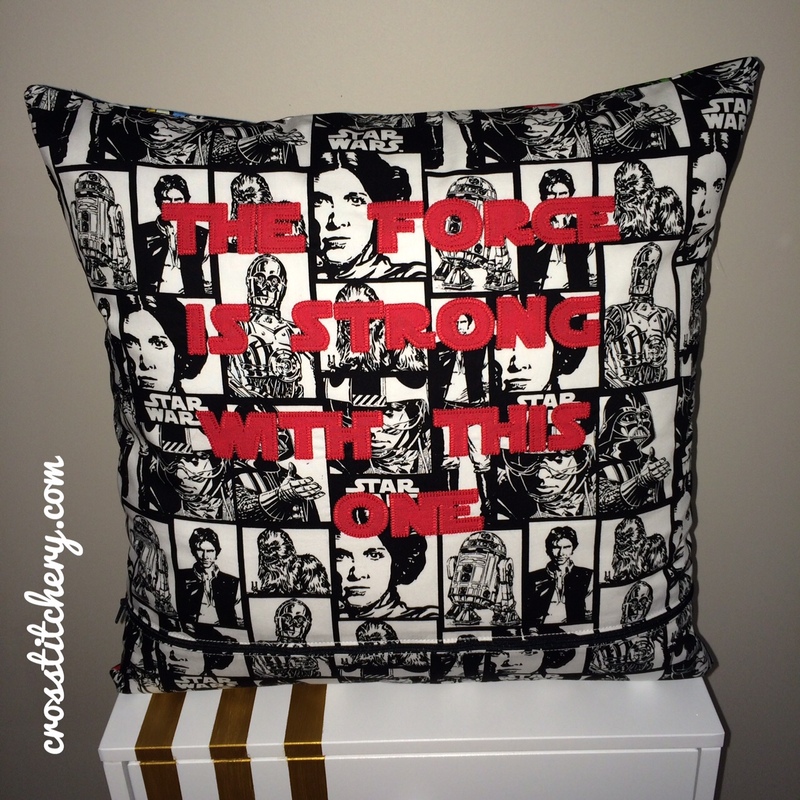 Star Wars Cushion – Finito! My latest commission is a Star Wars inspired cushion for a baby shower – the mother to be loves Star Wars, and her thoughtful girlfriends decided to have a cushion made specially for her and her new baby! I had such fun making this one. I personally haven’t seen Star Wars, so I’m obviously not a huge fan, but I love people who are passionate about their interests, and I can’t help but get swept up in the wave of their excitement. My clients decided to put, ‘The force is strong with this one,’ on the back as the personalisation, which so darn cute! No doubt the mother to be will love their thought and effort they put into this gift. 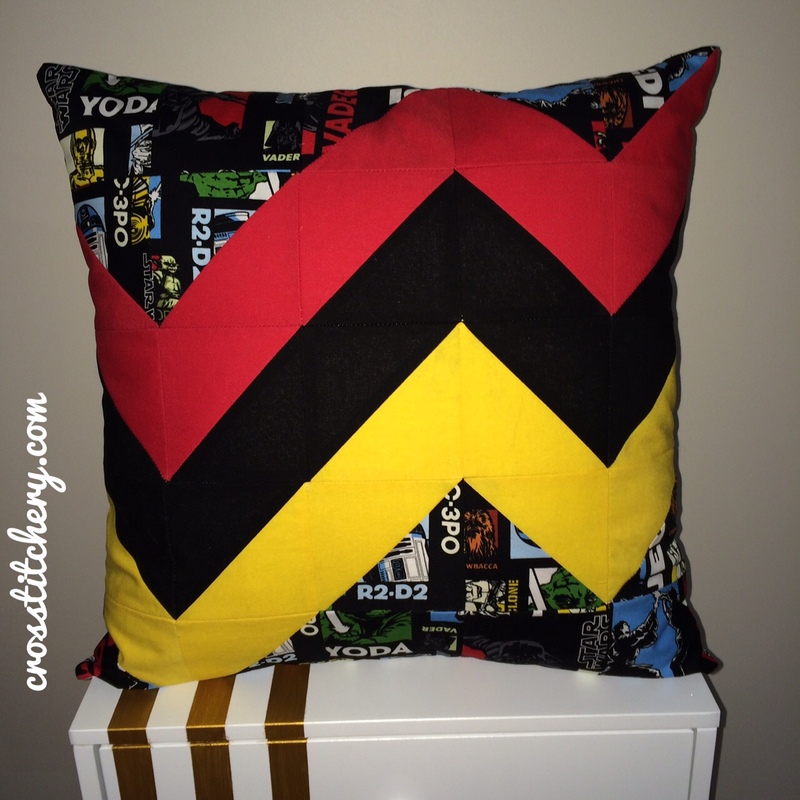 I chose to do a bit of a change of standard chevron with solid red, yellow and black. 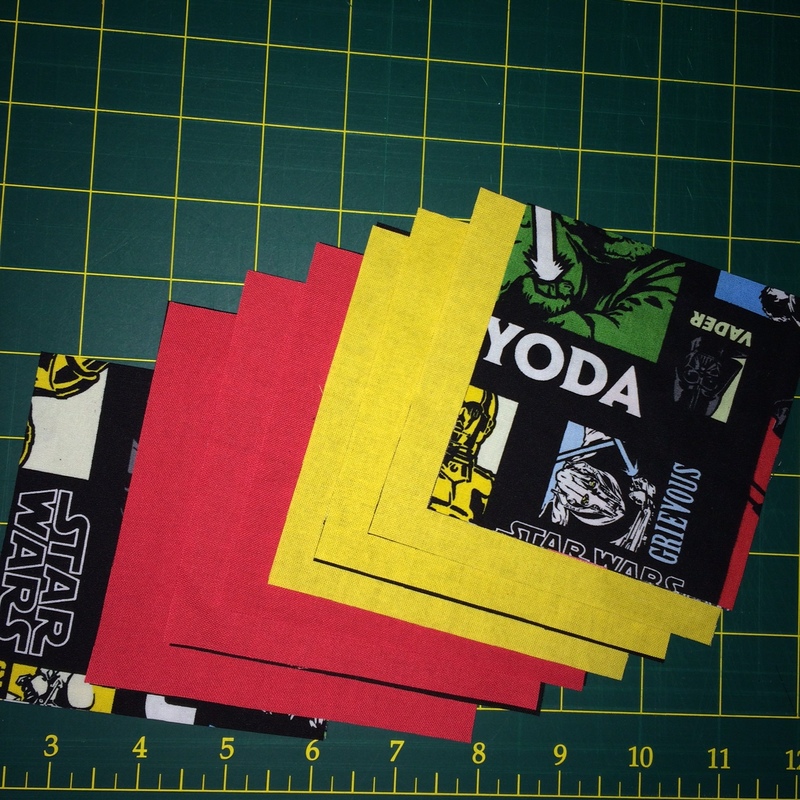 The surrounding fabric is licensed Star Wars fabric, and is really colorful (though you can’t see that in the photo). The back is also licensed Star Wars fabric, and I appliqued the letters with red so they’d really pop against the black and white. I’m really happy with how this one has turned out, and I hope the mother to be loves it too! I’m so close to finishing this commission; it’s been a mammoth task as there’s quite a few elements to this quilt, but I’m on the home stretch now and wanted to share its’ progress. The front is a geometric pattern in primary colours – you can see it here! The airplane applique is all done, and so is the applique for the back! 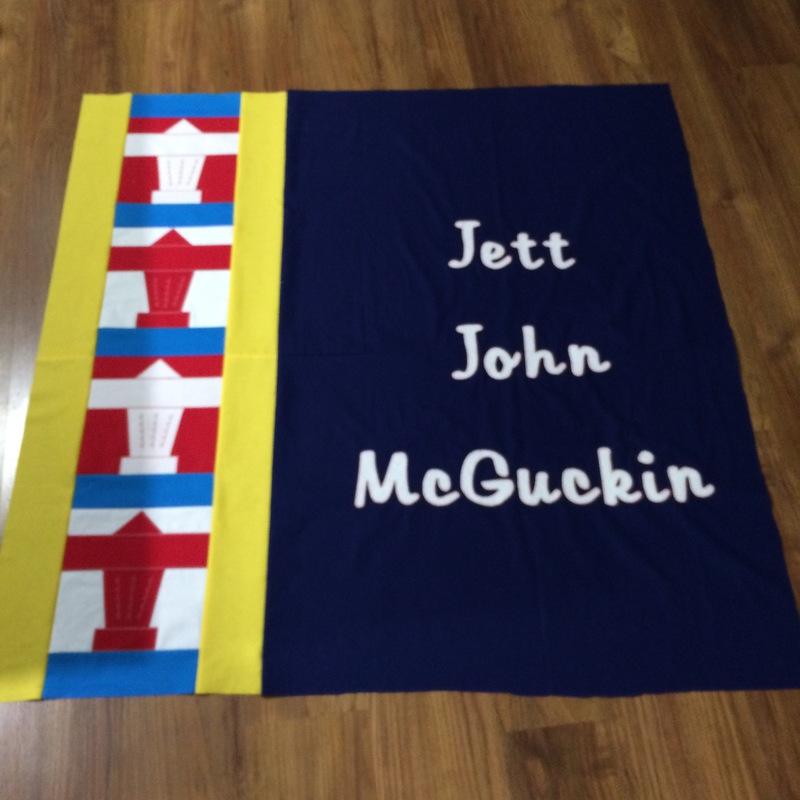 It was hard work to applique Jett’s full name onto the back of this quilt, due to the size of the back. At first I was going to colour block the white letters onto a red rectangle, but I thought it would have a better contrast against the dark navy backing. I’ll be finishing off the binding tonight, and then this commission is ALL DONE! I can’t tell you how happy I’ll be when my client has her order; she has been super excited which had made me very excited, but has also made me feel a teeny tiny amount of pressure though. 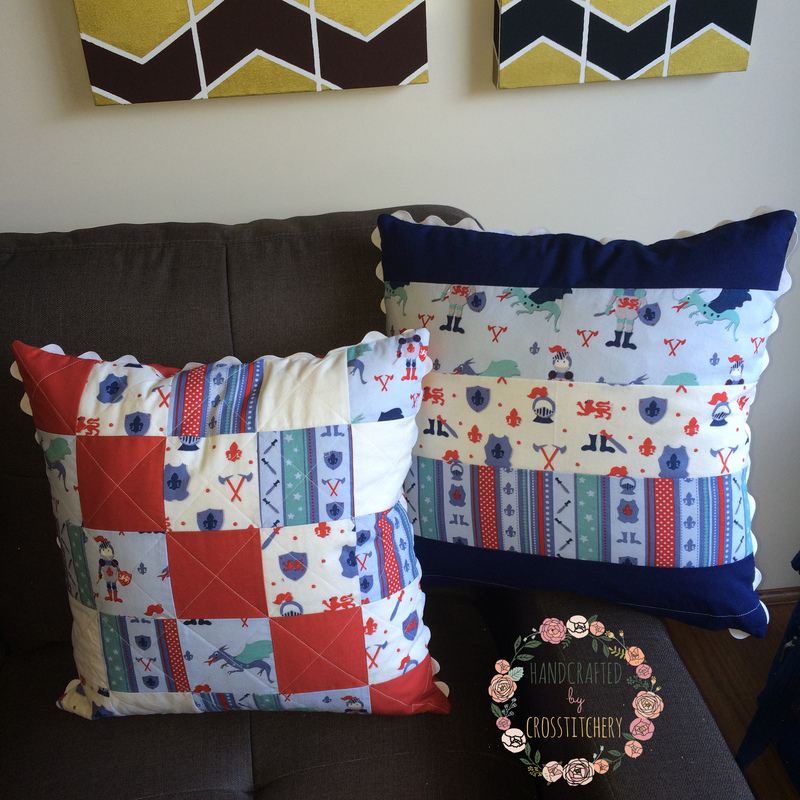 I used the same fabrics on each cushion front, with the only difference being the red and blue fabrics, and the direction the run. I thought it would be more appealing to the eye to have similarities, but some differences too. The backs of the cushions are also the same, with horizontal feature fabrics, and a top and bottom in the front colours. Here’s a squiz at the back of the blue cushion. 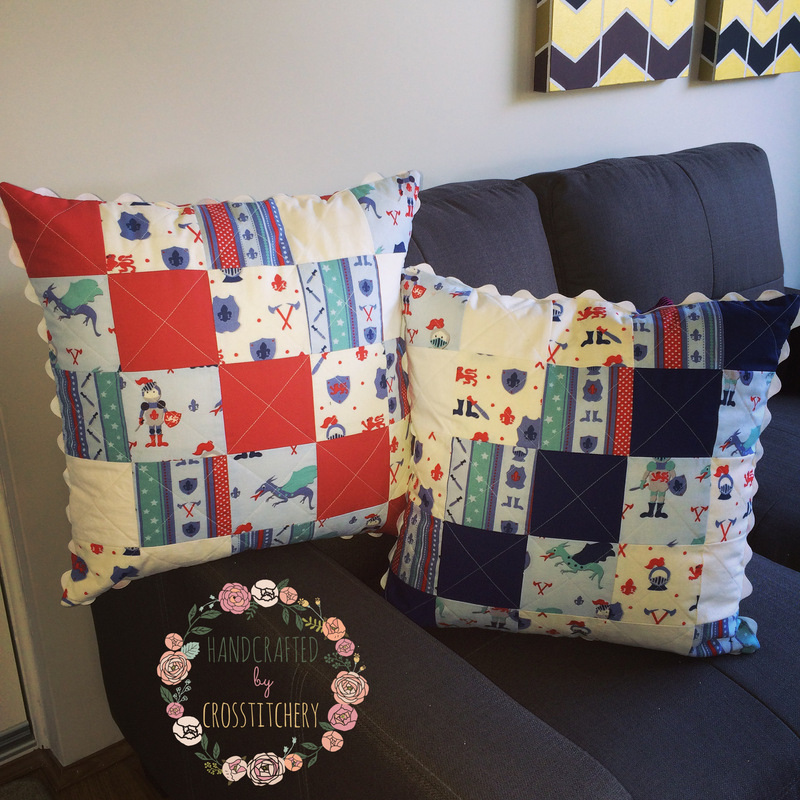 I’m so happy to say the lapped zipper worked out perfectly on the blue cushion – I must’ve been so tired when I did the red one! I’m really happy with how these turned out (minus the wonky lapped zipper on the red cushion), and I especially love the ric rac trim. I’m onto my next commission now, and will be posting some details soon so stay tuned!